It might the most epic film on my favorite film list, when I first saw it, it completely blew me away, it told me War films aren’t just about the action, but it can be much more, and it was much more in Apocalypse Now. This is by far the best War film for me, it is that tense of a film, that I have heard people calling it a horror film. Apocalypse Now starts with one my favourite scene’s of all time and with one of the very best songs that my ears have heard “This is the end, beautiful end, the end“. This is one of the most powerful films I’ve ever seen, each scene by scene, it becomes more path-breaking. This is one of the very best film of the which I think is the best and my personal favourite decade in film history the 70’s. The performances in the film, this is one of those films in which I remembered the performances even after watching the film, from weather it’s Martin Sheen, the great Marlon Brando. Apocalypse Now strength lies just not only in the great action sequences, but writing, having read it’s screenplay separately, this is one of the finest piece of work I’ve ever read. Every time, I set to see this film, I get into a journey not a film, the atmosphere of terror this film creates has to be yet matched in my eyes. I love every bit of this film, this is one of the most complete films I’ve seen, and that ending, the music, Coppola was surely the genius back then in the 70’s and this was his last film of the 70’s which left a landmark. This film may not have battle sequences like Saving Private Ryan, poetic elements of The Thin Red Line, but what this film has none of those films have. Besides, all the serious aspects of the film, it is highly entertaining, it has some special moments like the “dance girls” scene’s, which are fun to watch. 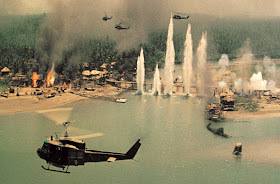 Apocalypse Now is a film, which is an unforgetable experience, this is one of the most re-watchable films in my opinion, the hype that Coppola accomplishes to create is memorising. Apocalypse Now is arguably known as Coppolla best work, and it may be considering the epicness, though this is the first Coppola film on my list, and would not be the last. If you haven’t seen any Coppola film, or not seen except any Coppola besides The Godfather’s, this one is the film, that you should watch next. In the end, thanks Coppola for dominating the 70’s and making masterpieces after masterpieces, and for making a phenomenon known as Apocalypse Now.